I’m so excited to share with you one of my favourite recipes of all time for this week’s Swap-out Sunday. The original is from one of my mom’s old cookbooks; the page is stained with the splatter of batter from Sunday mornings past. I copied it out by hand when I went away to university, but it was actually one of the first recipes I tackled on my own, in high school. When a craving hit, I had to whip up a batch, even if that meant driving home at lunch with my best friend and being late to third period biology class. Whoops. This week, ditch your Aunt Jemima mix and make special pancakes from scratch. 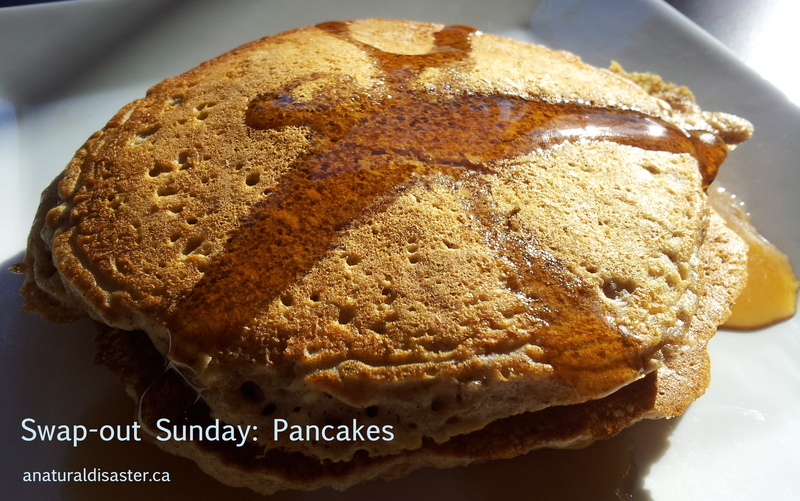 Pancake mix may seem innocuous enough, especially if it’s the type you add fresh ingredients (milk, eggs) to. Depending on the brand, mixes might contain only a few ingredients (fortified white flour, sugar, baking powder, etc.) or a laundry list that includes dextrose, partially hydrogenated soybean oil, and corn syrup solids. Basically, they’re similar to bread – at best, a bleached and processed nutritional wasteland; at worst, additive city. If you’ve never made them, please believe me when I tell you that homemade pancakes are just so much better, both nutritionally and taste-wise. If you’re looking to modify an existing recipe, keep in mind that whole wheat flour is heavier than white flour. I would recommend choosing recipes with moist ingredients (like mashed banana or yogurt) and plenty of leavening (baking powder, eggs). That being said, I have made my oatmeal pancakes eggless and vegan and they still taste great – they’re just less fluffy. In a large bowl, blend together oats and milk and let stand 5 minutes. In a medium bowl, stir together flour, sugar, baking powder, salt and cinnamon. To the oat mixture, add the beaten eggs, melted butter, vanilla, and the large bowl of dry ingredients. Stir gently to mix. Heat an unoiled grill or large frying pan over medium-high heat. 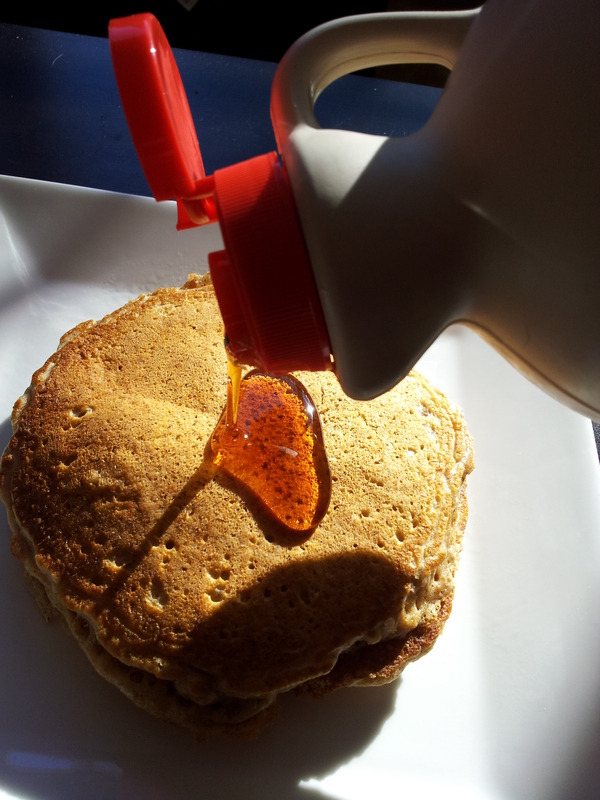 Use approximately ¼ cup batter per pancake. Flip when small bubbles appear on the top surface – a few minutes at most. Cook for 1-2 minutes more, until golden brown. Keep cooked pancakes warm under a tea towel while you cook the rest of the batch. Serve with unsweetened applesauce or real maple syrup.